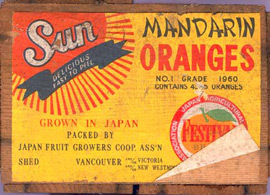 A label from a box of Japanese oranges grown in 1960. Mikan is a tangerine-like citrus fruit that is grown in warmer regions of Japan in large quantities. Many different varieties have been introduced to Japan from China since the eighth century, but since the late 19th century the most important variety has been the unshu. The unshu mikan was transplanted to Florida in 1878, and came to be known in the United States as the Satsuma orange. At the same time, the Meiji government experimented with European and American fruits, among which were navel oranges brought from the U.S. in 1898. The cultivation of mikan in Japan was also improved using new agricultural methods following western examples. After World War II a large number of Japanese food producers began to market canned mikan and mikan juice. In 1955, mikan was also exported to the United States for the first time.